For twenty-nine years editor Stephen Jones has been selecting the best horror stories of the year. Usually the anthology appears around October; the latest volume, Best New Horror #29, is actually a bit late, being published in February 2019 but showcasing the best of 2017. As customary the book also includes a comprehensive overview of the books and movies that appeared during the year, and the changes in the horror publishing world (including pertinent obituaries). The current volume assembles twenty-one stories penned by some of the most acclaimed horror writers in the genre, addressing a variety of themes. One always wonders if the tales are really the best, and comparisons are often made with the choices of other anthologists compiling the year’s best horror stories. I have long concluded that those are useless questions. With a few exceptions of outstanding quality, on which anyone can agree, at the end of the day personal taste is what really counts. Therefore, following that same way of thinking, I’ll mention here the stories that I found the best in this particular anthology. “Cwtch”by Conrad Williams is a perceptive, atmospheric tale in which the ghost of a family tragedy comes back to haunt the only survivor, while “Banishments “ by Richard Gavin is a poignant, dark piece blending family matters and cyber tricks. William F Nolan contributes “Carnivorous,” a strong though rather predictable tale of botanical horror, and Angela Slatter gives us “A Song of Dust,” a sinister fable featuring a naive young bride and a wicked, greedy husband. In the vivid “The Seventeen-year Itch” Garth Nix describes a weird, irresistible itch affecting, at regular intervals, an old prison inmate, while in the labyrinthine, disquieting “ The Endless Corridor” by Reggie Oliver, the obsession of a dead writer for mirrors involves a scholar researching his work and life. Simon Strantzas’ “The Flower Unfolds” is a clever portrait of a lonesome, shy spinster whose life dramatically changes when she discovers a luxuriant garden at the top floor of her office building. Other contributors include Helen Marshall, Gemma Files, Alison Littlewood, Alison Moore, John Linwood Grant, Danny Rose, Tim Lebbon, Ramsey Campbell, Mark Samuels, Felice Picano, Michael Bailey, Nicholas Royle, Steve Rasnic Tem and Thana Niveau. 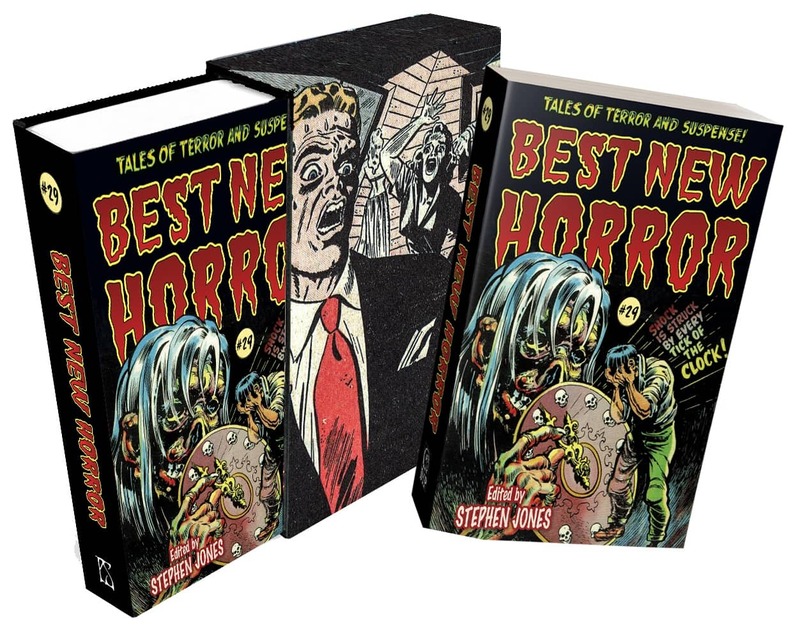 Best New Horror #29 was edited by Stephen Jones and published by Drugstore Indian Press in March 2019. It is 591 pages, priced at £14.99. The cover is by Howard Nostrand. See more details at the PS Publishing website. Mario Guslandi was born in Milan, Italy where he currently lives. He became addicted to horror and supernatural fiction (too) many years ago, after accidentally reading a reprint anthology of stories by Sheridan Le Fanu, MR James, A Machen etc. Most likely the only Italian who regularly reads and reviews dark fiction in English, over the years he has contributed to various genre websites such as Horrorworld, Hellnotes, The British Fantasy Society, The Agony Column and many more.